I've had this photo for a while and I forgot to post about this meal. I bought some lamb chops at the farmer's market a few weeks ago and cooked them up. You all know I am obsessed with lamb right? I don't know why, I just love it! Anyway, I was so happy when a vendor at my local farmer's market started selling it. Healthy Family Farms woo! A nice satisfying meal of lamb chops - marinated in garlic, rosemary, salt, red pepper, lemon and then seared quickly on high heat. Served them over kale sauteed with shallots and garlic. Don't they look lovely all in a circle? Last night I made some chicken stock from some leftovers in the freezer. There is just nothing better than homemade chicken stock. You can just feel the healthy goodness from the bones, herbs and veggies...I guess maybe there is a reason they call it "Jewish penicillin"? haha! Have a terrrrrrrific day dearest readers! I picked up some ground pork from Rocky Canyon at the farmer's market this weekend and thought I'd make some pork patties for dinner. Of course since I like everything to be really flavorful, I pondered my options with the ingredients I had lurking in my kitchen. Thai green curry sounded good, so I thought I could mix in some curry paste (Mae Ploy) in with the meat to make savory patties. Since I like things hot, I mixed in quite a bit. That was a mistake. The pork patties turned out really tasty but too salty. Next time I'd use a bit less paste and add some chopped serranos and garlic to the meat as well. Alongside I made a simple salad of chopped romaine and cilantro. The dressing was lime juice, a bit of curry paste, and jalapeno-lemon olive oil. That was yummy! I had some leftover roasted poblano so I chopped that up and threw it on the plate too. It's Monday my friends! How are you? I thought I'd share some photos of goodies at the farmer's market this weekend. It was a lovely spring day and I picked up some great stuff: lamb chops, ground pork, eggs, veggies, fresh herbs, meyer lemons, and some tasty raspberries! strawberries and fennel - so springy! So here is the tasty dinner I made. Once again, simple and easy as pie! (why do they say that? pie is not easy to make) I sauteed some beech mushrooms in butter with garlic, red pepper flakes, and rosemary, then tossed in some fresh spinach for just a second. 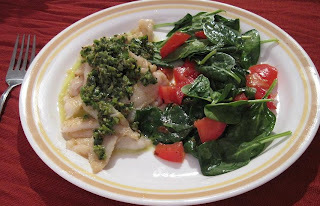 Same seasonings on the dover sole, which I cooked in the same pan after removing the mushrooms and spinach. Probably a total of 8 minutes from start to finish, including going outside to steal rosemary off the neighbor's bush. Have a great day kiddos! Laugh a lot! Oh I had the best dinner last night! Yum yum! I picked up some of that Dover Sole I like so much and decided to make a little spicy cilantro sauce. I charred a poblano pepper on the gas flame of my stove for a few minutes, then chopped it up and threw it in the blender with a big handful of cilantro, a clove of garlic, olive oil, lime juice, salt and toasted cumin seeds. Quickly cooked up the fish in some butter and poured the cilantro sauce on top, some blanched spinach and tomatoes on the side. Yum yum yum! So tasty! Happy Easter Happy Solstice Happy Pesach Happy Hanamatsuri! etc! Sorry I have been MIA. I did make a tasty dinner the other night with whatever was in the kitchen. I'm so lazy lately I know. But this one was very good! I had some paper thin sliced beef which I marinated in korean red pepper, sesame oil, and rice vinegar for a short while. Then I quickly grilled it up on a hot hot hot grill pan. I cut up some lettuce (the only veggie I had in the house) and made salad dressing by diluting a little of the unused marinade with more rice vinegar. More unused marinade served as a dipping sauce for the meat. Yeah. Simple. So simple. And SO GOOD! Sorry I have been neglecting you my friends. I'll get more creative in the kitchen soon. I need to grab one of my million cookbooks and start getting inspired. Oh speaking of inspiration, I think I have mentioned that soon I am taking a little trip to Europe. Well, I just found out that part of the trip will be with a group in Paris where we will have some planned activites. (Not usually my type of thing but hey, all expenses paid, I'm not complaining!) Anyway, my hope is that one of the activities might include a cooking class - say at Le Cordon Bleu. Yeah! One can dream right? That would certainly provide some inspiration...I'll keep you posted!